THE One Show’s history correspondent Dan Snow arrived at Mountfitchet Castle today (Wednesday) to dish out a lesson on medieval punishment. The history buff came to the famous Stansted exhibition to film a piece on crime and punishment for the popular BBC One show presented by Adrian Chiles and Christine Bleakley. 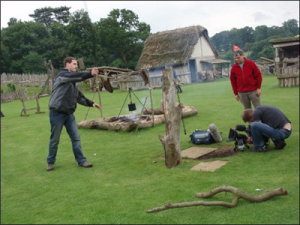 The film crew used many of the castle’s exhibits including a cat o’ nine tails traditionally used for flogging, a branding iron and stocks. “It’s fascinating how methods of punishment have changed throughout history,” said Dan. The features on crime and punishment will not be shown on The One Show until January.